Thanksgiving is a holiday traditionally observed in America on the fourth Thursday of November, and is also observed in Canada but on the second Monday of October. RIO DE JANEIRO, BRAZIL – Thursday, November 22nd marks the tentpole American holiday of Thanksgiving this year, and in Rio de Janeiro expatriates from numerous countries, and Brazilians, will be taking part in the traditional celebration of a fall harvest feast with family and friends. A Thanksgiving dinner plate on the way out of the kitchen at the Gringo Cafe, photo internet recreation. The first Thanksgiving in the United States is suspected of taking place during the fall of 1621, when Pilgrims broke bread with Native Americans to celebrate a successful harvest and to give thanks for their abundant lives. In Rio de Janeiro this year, while it is spring and not harvest time, expatriates and Brazilians alike will still carry on the tradition. Usually the largest gathering for Thanksgiving in Rio is the annual American Society of Rio de Janeiro (AmSoc Rio) Thanksgiving Dinner. Known for bringing expatriates together and offering holiday comfort with a chance to make new friends to give thanks, this year the event will take place on Thanksgiving Day at 7PM in the JW Marriott located on Av. Atlântica, 2600 in Copacabana. AmSoc Rio’s menu will include carved roast turkey with gravy, honey glazed ham, cranberry sauce, traditional stuffing, pumpkin, apple and pecan pie, wine and more. The price for American Society members is R$180 and R$220 for non-members and this year it is possible to pay at the door (with cash or check). Children 0-5 years-old can come for free, and ages 6-11 will only be R$75. The other amazing place to celebrate out in Rio is at the Gringo Cafe, which is owned by American expatriate Sam Flowers and since opening in 2010 they have made a point to keeping the Thanksgiving traditions alive and well. “We always have expats that live in Rio and visitors for the week that tell me they are so relieved that they can still celebrate Thanksgiving,” explains Flowers. It’s not just Americans that will be celebrating. “Many Brazilians have had the Thanksgiving experience in the U.S. and are also thankful for an opportunity to celebrate here,” adds Flowers. This year the feast will be offered from on Thursday from 12 Noon – 10PM and include roast turkey, gravy, stuffing and mashed potatoes, cranberry sauce and pumpkin pie. “As usual we make everything from scratch and offer a truly authentic homestyle experience,” explains Flowers. It is recommended to make a reservation in advance by emailing Sam directly at sam@gringocafe.com. 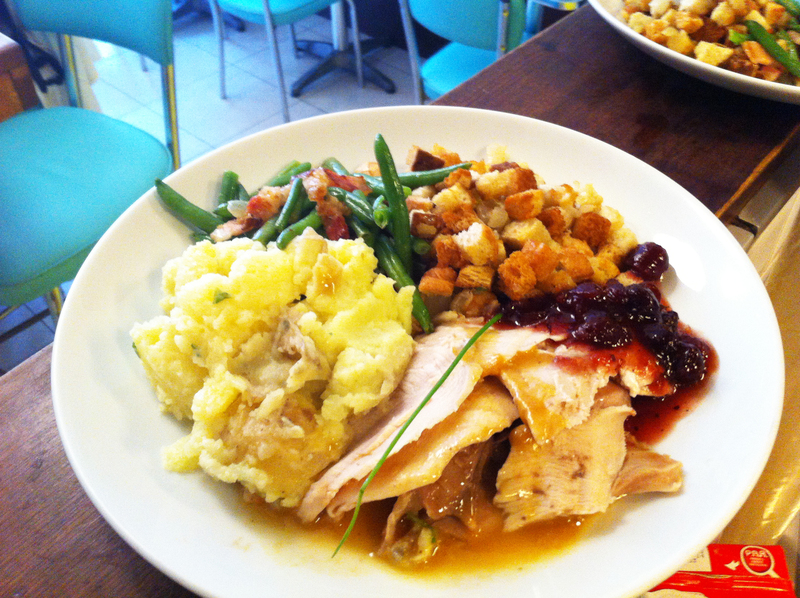 Take out options are also available, and they will continue the holiday menu through the weekend. Next articleGOL, Brazil’s Largest Airline, Launches Direct Flights to the U.S.